I was at Hampden the night he scored his goal. The good old days when we could support our national team. A big tim was big Jim. Aye he was ,January 3 1975 we went to parkhead to watch the reserves playing, only their main stand was open , a fair size crowd but it was segregated anyway the bold Jim rocked up with his wife/ girlfriend, we gave him pelters it was all taken in good fun but he made an exit shortly afterwards & reappeared at the other side of segregation & gave us a wave. Big Jim Holton's gonna half you son. I remember seeing him score v East Germany on the day Princess Ann got married to Marc Philips as we got the day off school. His brother lived in Hamilton. His niece and nephew are nice folk. Tarriers but good people. I was at hampden that night also. Same here, was a fantastic night, especially after going a goal behind. Us youngsters back in 1973 couldn’t believe we’d gone almost 16 years without qualifying for the World Cup Finals, so how do today’s youngsters feel? I was in the North Stand. Won 3 0? 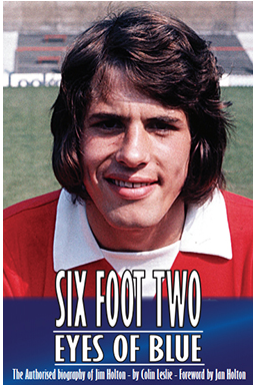 First time I seen Joe Jordan in the flesh as they say, came on for Denis Law if I am not mistaken? Proper Scotland team. Players like Jardine, McGrain, McQueen, Buchan, Jordan, Dalglish. Now you see them and your on Wiki trying to find out who they play for. No Wiki for me, don't watch them and couldn't give 2 fecks what tim/foreigner with a Scottish great Granny is playing. I enjoyed going to watch Scotland back then,how times have changed. I was in the Rangers end that night, in the days when you wore your Rangers scarf to Scotland games. Section J at Hampden was pretty much unbeatable for watching fitba back in the day. Aye, that’s how I used to go to Scotland games with a Rangers scarf. Big Holton dislocated his shoulder (I think) in a game and the physio put it back in on the sidelines game was still going on. Came back on and had a great game ( I think ). Nowdays I wouldn’t change channel to watch Scotland because of what it represents. I was in the Rangers as always, along with a Clyde fan, how times have changed? Was there too Sept 1973, my first Scotland game. Celtic keeper Hunter never really recovered from losing that first goal ! IIRC it was one of the last of the 100000 attendances where the true numbers were 10-20k more than the recorded numbers due to the amount of guys paying the turnstile operators cash. The South stand was easy to get into. Approach the steward at the emergency exit, he would kick the door with his heel and open sesame. Get inside quickly and square the guy up who was waiting on you. It was a slick operation. New the guy that used to let the invalid cars and such in the big gates at the Rangers end, section H.
Very seldom I had a ticket for a game at Hampden, didn't need one, that guy must have made a right few quid. Jim Holton was in the same resort as us during the Italia 90 World Cup (Alassio) and was on the same flight from Genoa to London as me, came across as a thoroughly decent bloke. For all that he was a “hardy big CÜNT”, Holton was no match for our very own “Greatest Ever Ranger” Big John Greig, who absolutely HALFED him in that “friendly” at Old Trafford in March 1974. “Ham ‘n’ egg” was playing with his right thigh heavily strapped up, but that didn’t stop him running over the top of Holton, the young pretender. But don't worry, with his pace it's highly unlikely he'll catch you". Back when OAE was funny.